Today we’d like to introduce you to Jane O’Hara. I grew up in the suburbs – one of 5 children. There was a large gap in time before I was born after my older siblings, and for that reason my older brothers and sisters left home by the time I was about 6, as well as my younger brother who is intellectually disabled and was moved to an institution. A busy house became quiet, my parents in their world, me in mine. I think it was actually out of loneliness that I used to draw and paint places and people I wanted to be. My best friend Sammy – the dog- soon entered my life, so between my younger brother who didn’t speak, Sammy, and the power I felt in being able to create worlds on paper, I learned best to communicate without words. At that point I started a decorative painting business working with interior designers painting murals, glazing walls, and other finishes. I stopped doing my own painting for more years than I’d like to admit, but later, when I met my current husband, we would both go landscape painting together which reignited my desire to paint. It was when I got back into painting that I realized painting landscapes was not doing it for me. 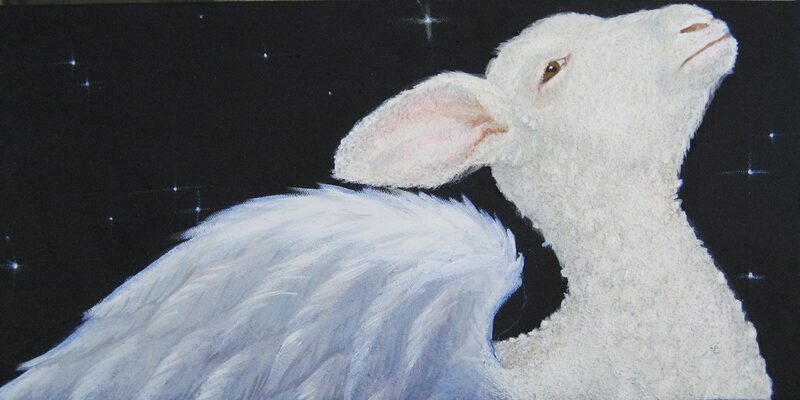 I began to bring pictures of animals as reference and inserted them into my paintings- and they never left! I’ve always loved animals and would celebrate their beauty and humor in my work, but it was the act of painting them that opened my heart more to these animals. I began to learn a lot about what goes on with animals behind the scenes in agribusiness and entertainment, and that began to inform my work. Their situation poses a duality which I find both disturbing and intriguing. We’re insensitive to animals raised in captivity and treated inhumanely, but we cast human traits onto pampered pets. I use humor and a type of subtle surrealism to create a stage- often an unnatural setting to illustrate how we impose our own agenda on these animals. 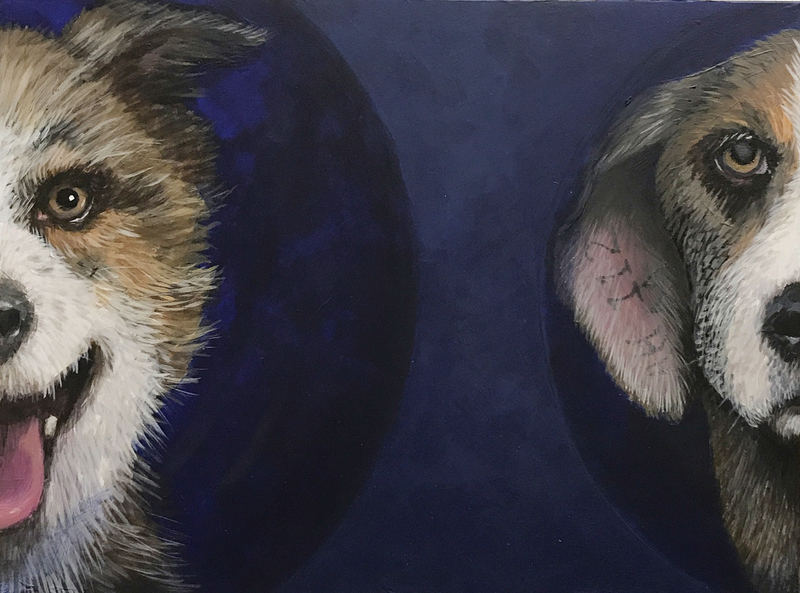 With my paintings I try to create a way for the animals to speak from a place of honesty about their state and the relationship of human beings to it. 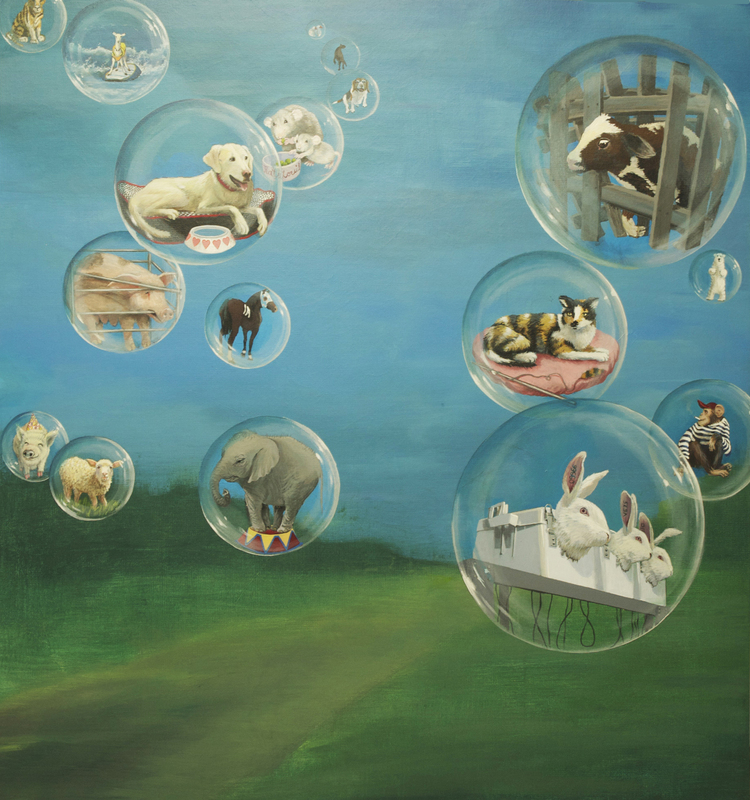 I began to realize I could use my artwork to give voice to those animals who have no words. I paint what I paint because I increasingly feel that this is the time on the planet that we human animals need to change our treatment of our fellow animals. There are many ways up the mountain and my way is to try to reach people visually, where messages and feelings can sneak in subconsciously, where with discussion there might be a defended reaction. My experience is that nobody wants to hear how their eating or entertainment and fashion choices are cruel and create suffering – especially when they passionately love their dogs. I’ve been told my approach of expressing these conflicting realities with my paintings actually works sometimes, which makes me exceedingly happy! I continue to paint animals in quirky and happy situations too. One of the things that happens with me when I paint the animals is that they become very real. I’m stroking them with my brush. This can be very hard when I am painting a calf in captivity, or a pig in a crate, but loving and fun when I’m painting someone’s animal companion, or a joyous free animal. Several years ago I was awarded the opportunity from Newton Art Center, MA to curate an exhibition in the Boston area. 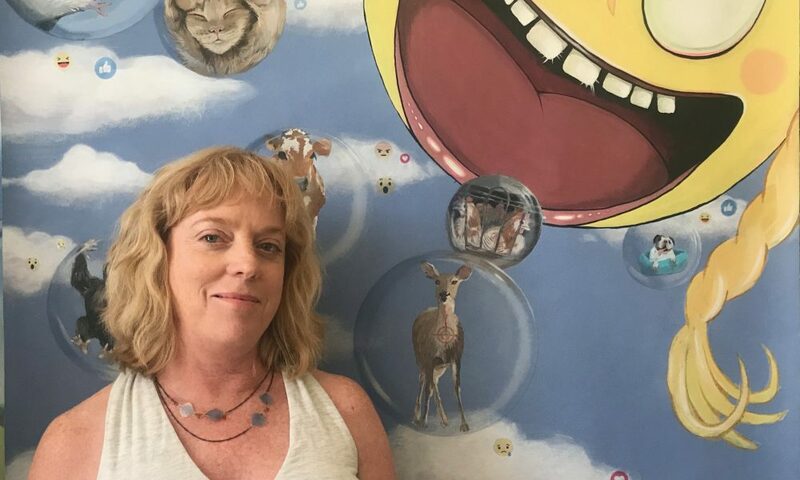 I joined a group of artists for Beasts of Burden, a show which was an expansion of what interests me with my own paintings, the complex relationship we have with animals. 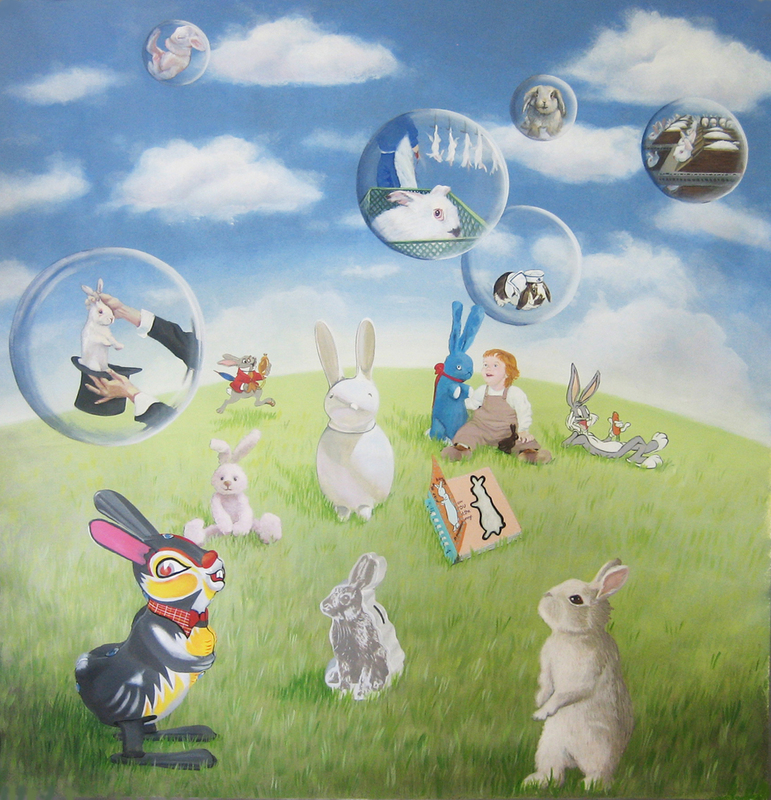 Working in diverse media the artists include animals from their perspectives. As a group, we consider our complicated connections to these creatures and the many ways they are entwined into our lives and psyches. I think depending on what one’s genre of art is, the challenges differ wildly. My main interest in painting is in communicating different ways to look at the human-animal bond. In order to speak for the animals, I need to draw the viewer into these worlds by creating an animal that speaks to you. I have succeeded when one person is moved by a painting, but I also feel my challenge in moving forward as being able to reach a larger audience. There is a place for my work in the animal rights movement, donating work to fundraisers for organizations that help animals, and I feel good that my work can be supportive in that way. But I also have the desire to have my artwork valued in the art world. It is a challenge to find the best venue for my work as it straddles different worlds. 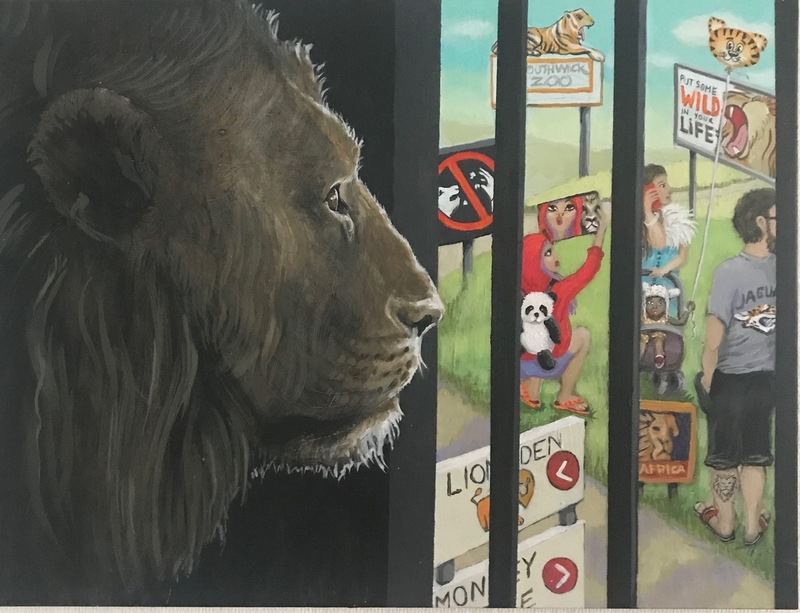 My work with the animal as theme can be thought of as a niche- one end of the spectrum being animal portraits to the other of animal activism- neither necessarily taken seriously as art. There have always been artists that succeed despite the fact that they may be painting in a style that is not popular, and that’s what I hold onto. I find good fit galleries or venues for my work to be the biggest hurdle. I feel a sense of urgency, even though I’ve been incredibly fortunate to have the opportunity to expose my work in many ways with levels of rewards for it. My challenge is in moving forward, trying to reach more people. I don’t focus much on the overarching challenges -like being a female artist, a *not* 20 something artist, the art market, because I want to focus my energies into creative thinking of how to get my work out there. And most importantly, for me to focus on these (very real) concerns can make me want to give up. I know my work is an uphill battle, and maybe everyone’s is, but it’s important to me, so I have a belief system that to work towards something, and get the fears out of the way, that success is inevitable. No, I don’t always believe that, but that’s the real challenge I try to put my energy into. How’s THAT for a convoluted answer? People can see my work in Provincetown, MA at the William Scott Gallery, where I am grateful to have been showing for about 5 years now. I am often included in various group shows with an animal theme, so checking my website and getting on my email list is the best way to see what is new. 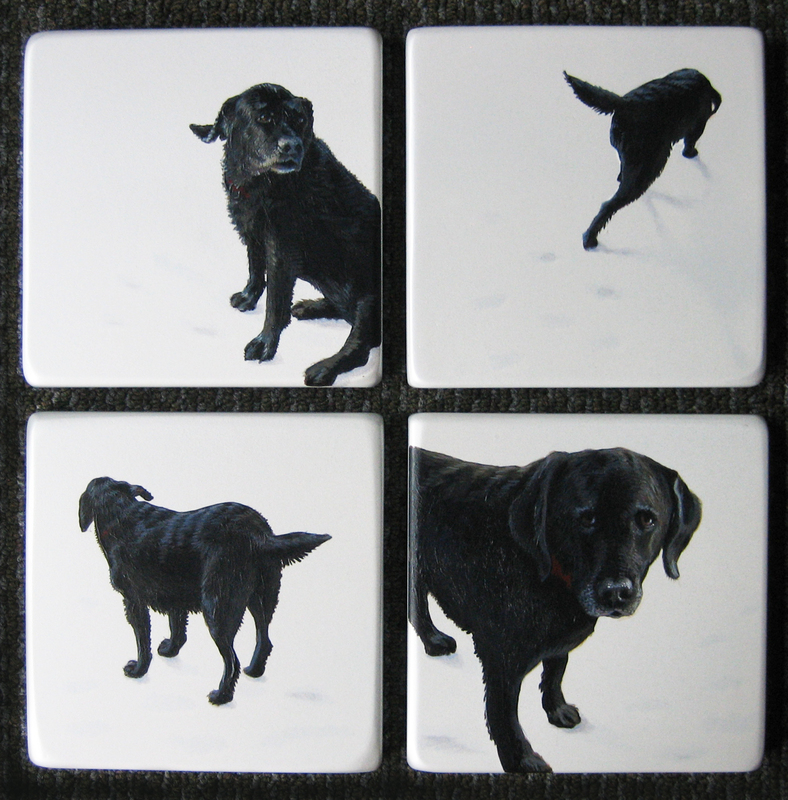 I also can be commissioned to paint people’s companion animals. On the commission page of my website I have links to paintings I have done. I like to approach each piece as I do my noncommissioned pieces; using surfaces, backgrounds, compositions, involving a narrative at times, and color to help express that animal best. I like to work with the animal’s human in the early stages to get to know the animal- if I don’t already- and to come up with ideas how to best capture the animal- artistically that is. 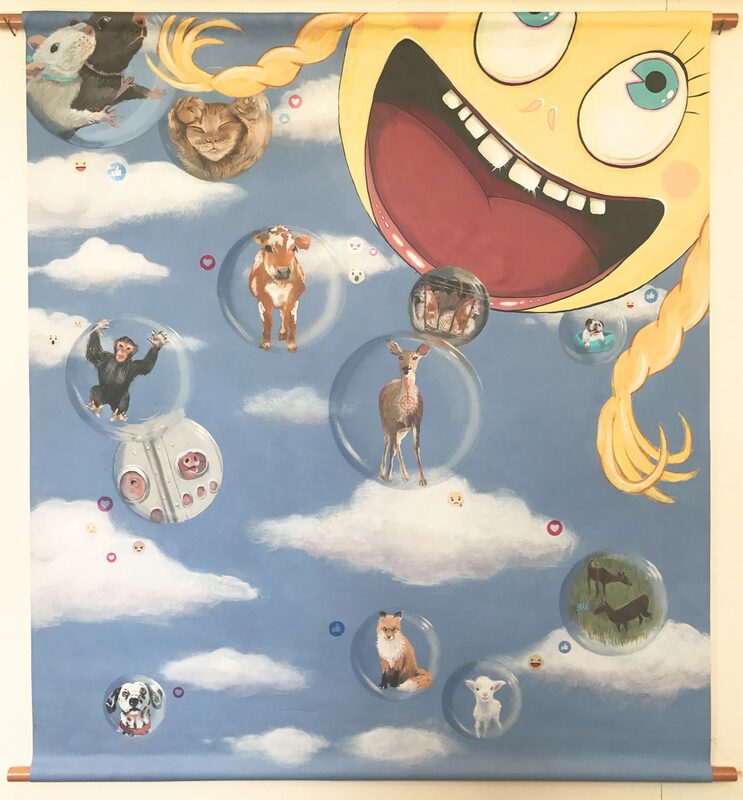 I also exhibited the show I curate, Beasts of Burden, as a Pop-up in NYC to coordinate with a multimedia presentation I gave about my artwork and the artists in the exhibition for the Compassion Arts and Culture & Animals Festival. I am now working with a great museum in the Northeast with hopes to have the evolving Beasts of Burden exhibit there. I am very excited by the idea of reaching the audience that a museum attracts and am looking into other museums to see if they have interest. All of the updates on my work and Beasts of Burden are on my website, and when I have something to share, it is all over social media! Hi Dear Jane, Fingerpainter here, so truly delightd to see your paintings, Lamb with wings strikes a strong chord with a sweet melody. your 4 black dog images seem familiar,9sigh) but you white lone laying down dog is my breathable favorite!